Map of Poland and Silesia region. VS on snowy streets, Polish civilian refugees on horsecart and truck are led from city. MCU Polish soldiers and Russian prisoners marching through town street. Volkssturm build barricades. VS refugees board train. 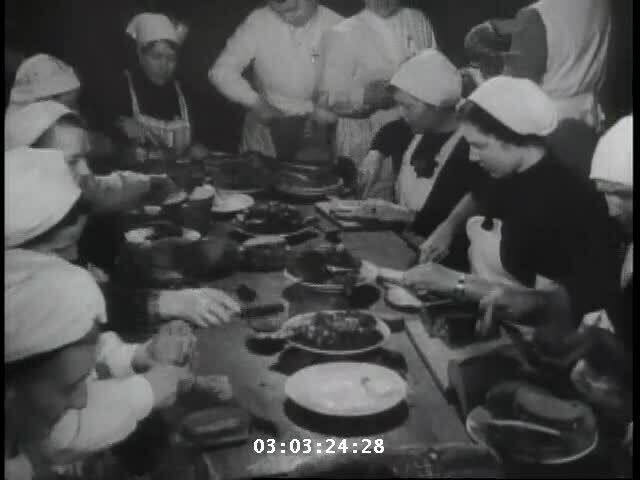 VS People are given ID papers and fed meals prepared by German Red Cross. CU Men with fur caps and "Deutscher Volkssturm Wehrmacht" armbands being issued equipment and weapons and march off. MCU Artillery shells & guns are unloaded from truck and then moved off in donkey carts. Column of German tanks and then trucks move forward. MCU Sign: "Kattowitz." Street scenes of tank action. LS City of Kattowitz. VS Anti-tank troops positioned in streets and trenches with long handled explosives. German trucks mounted with men and artillery move along road. LS Infantry in snowy field moves toward camera. Tanks roll. German artillery battery fires at Russian position. LS German infantry in winter white crosses field. MCU JU87 aircraft attacking. AV city of Kattowitz. Bombs are packed and loaded into glider. Woven boxes loaded. Plane takes off. AV Glider in flight. Interior view, pilot. AV Glider released. Interior view as bomb drops from plane chute. Quick LS of car on beach. German machine gunman in trench. Soldiers behind barricade put money into helmet; amount recorded on sheet. Trucks trying to move in winter storm, digging out tires. German soldiers in white winter gear digging out trench, crossing field as they lay wire. Intense cold and snow. 3:00:25 to 3:01:06 Children greet wounded German soldiers. MS Packages handed to soldiers through train window. VS Soldiers moved from train to buses. 3:01:07 to 3:02:24 Western Front. VS German soldiers exchange fire with russians using artillary, mortar, rocket launchers. CU German infantrymen. LS destroyed Russian tanks. CU German soldiers in trenches.